Waterboys uses a low pressure house washing technique termed “soft washing.” We apply a detergent to the house, and it does the work. Then, we simply rinse off the dirt with the same pressure that you would use with your garden hose. High pressure can damage siding and its underlying materials. Our proprietary blend of algaecide and surfactant destroys mold, mildew and other organic materials; yet is safe for your landscaping. We apply the detergent to your home with no more pressure than a garden hose. Then, we hand scrub your gutters to remove dirt and debris. After the detergent is allowed to dwell for some time, we rinse it away along with the mold, mildew, and algae that has accumulated to your home. This is not pressure washing. 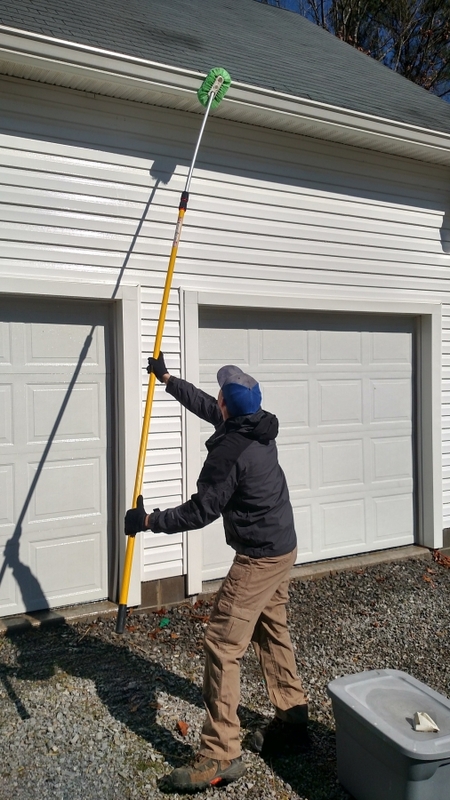 Pressure washing can damage siding and it’s underlying materials. The pressure washing technique is used to blast away dirt and algae. Our process is much safer for your home. Water that is forced behind siding can create pockets of moisture that could turn into mold or mildew. Not only that, but high pressure can damage the surface of vinyl siding, destroy wood trim, and blow mortar from your brick. Never let someone pressure wash your home. If I could suggest one thing to homeowners about cleaning their homes exterior, it would be to use the right cleaning detergents and use them safely. De-greasers can deteriorate painted surfaces and etch window glass. Never combine chlorine bleach (Clorox) with an oxygen bleach(OxiClean) and try to form a “super cleaner.” These chemicals mixed together create a poisonous gas that could lead to severe injury or death. Also, homes should never be cleaned with straight chlorine bleach. It can damage vinyl or lap board by distorting the paint/dye. Our cleaning detergent is safe on all surfaces. Working from ladders is one of the highest causes of injury in the United States. Waterboys rarely uses a ladder, as we can apply detergent up to 35 feet from the ground. Our commitment to safety on your property is second to none. You can rest assured that safety is our number one priority, then comes customer satisfaction.